There's a new Lego Dinosaurs range for 2012. The range includes dinosaurs and people living at the same time and some of those dinos look scary! If I had to come up with a top 5 list of things by two boys like, Lego and dinosaurs would be guaranteed a place! The new Lego Dino 2012 range looks superb. It's aimed at kids aged 5-12 and this is the kind of Lego that you really play with once you've built it. The range includes lots of cool dinosaur figures, dinosaur hunter minifigures and vehicles and buildings. There are tranquiliser guns for when those dinosaurs get out of hand and an HQ with big gates. 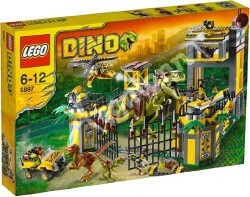 Let's take a look at the Lego Dino 2012 range. The Dino Defense HQ is the largest of the initial Lego Dino sets. 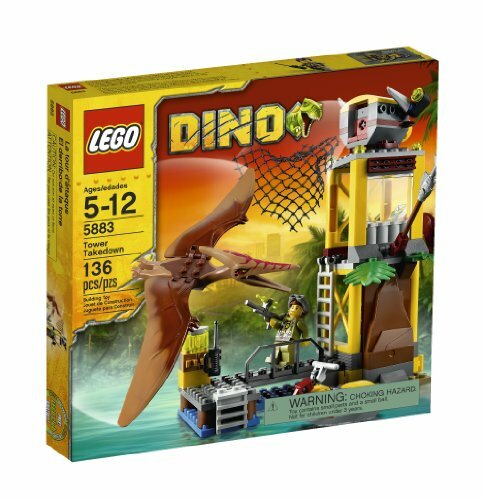 Lego Dino Ambush Attack 5882 is one of the smaller sets in the range. 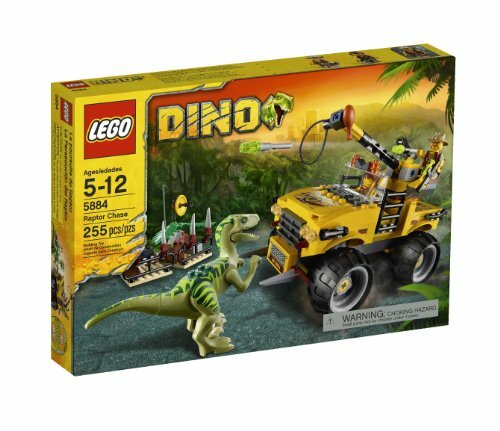 The dinosaur in this set is a Coelophysis. Very cool. Coelophysis was one of the earlier dinosaurs, from the Triassic time period. The other dinosaurs in this range are from the Late Cretaceous, I wonder what his story is? Scientists think Coelophysis was fast runner, he was a meat-eater and could be up to 3m long. So the off-road vehicle with flick missiles and the tranquiliser gun in this set are probably a very good idea! 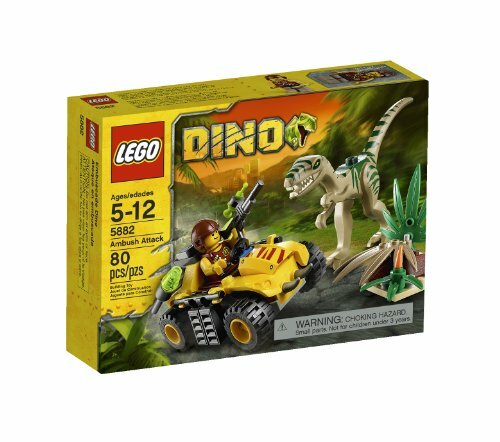 The set includes a dinosaur hunter mini-figure who needs to capture the Coelophysis to protect the city. This Pteranodon is causing havoc and needs to be captured from the Tower using the net shooter. The dinosaur hero minifigure is ready with a tranquiliser gun. There's a jet boat waiting in case he needs to make a quick getaway! 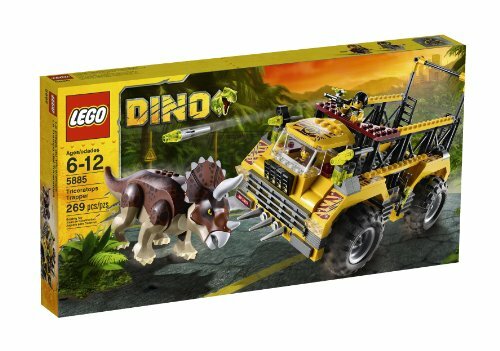 Lego Dino Raptop Chase 5884 includes a big-wheeled off-road jeep with a lasso attachment. 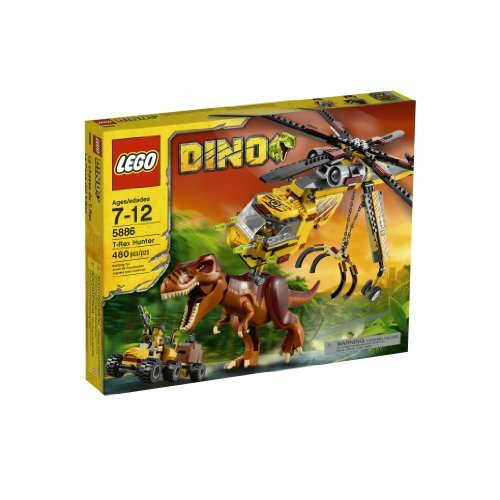 The dinosaur in this set is a Raptor. Raptor is the general name for a group of dinosaurs including the Velociraptor. Raptors were small, fast carnivores. This set includes two mini figures and lots of accessories. The big herbivore Triceratops is the star of Lego Triceratops Trapper 5885. Triceratops might have been a herbivore, but you wouldn't want to disagree with one! Look how big he is next to the to dinosaur hero minifigures. This set includes a big Lego vehicle to built. It has a cage on the back that the Triceratops can fit inside. You're going to have to lure him in first and then tranquilise him Good luck with that! Lego Dino T-Rex Hunter includes the always popular Tyrannosaurus Rex. T-Rex was a really big carnivore. It's going to take some serious kit to control this dinosaurs. So the set includes a cool helicopter with a harness and winch. The guy on the ground will need to help from his scout vehicle! 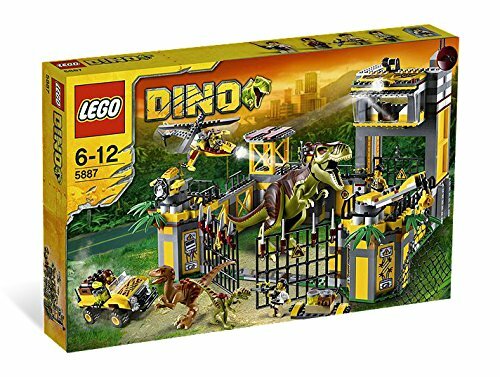 Lego Dino Dino Defense HQ 5887 is the largest set in the initial Lego Dino 2012 range. It includes a big HQ with lots of defenses and closing gates. You also get a helicopter and a jeep and 4 hero minifigures. And there are 3 dinosaurs included in this set: T-Rex, Raptor and Coelophysis. When you combine with the other sets you'll get two of theses dinosaurs which is great for playing with the sets. We have the Lego Dino Valley set. It's brilliant for little dinosaur fans. My 5 year old still plays with it and it's perfect for his little brother. 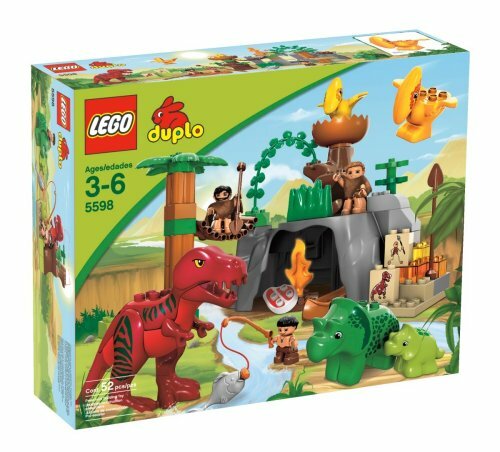 Did you like the Lego Dinosaurs 2012 sets?